We are a responsive web design agency that believes that our customers deserve to stay ahead of the curve. With our responsive designs, your customers are given the best viewing experience possible on any device. Because our designs are truly responsive they will work with any present or future device. We will help you get the most out of your website design. Responsive website design is needed in today’s market to be competitive. The one size fits all website design is dead. 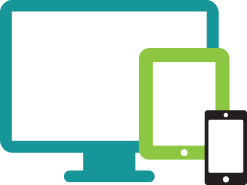 With a responsive web design your website will rearrange itself to better fit a phone, tablet or desktop screen. IS YOUR SITE RESPONSIVE? CLICK HERE TO FIND OUT. Sign up for our newsletter and get the latest info on new products, events & more!